A designated formula, rich in nutritional components which act to hinder the prostate gland's enlargement process, to enhance the flow of urine and to prevent and reduce carcinogenic processes in the gland. The prostate gland is found in men only and is responsible for secreting the seminal fluid. In most men over 45, a benign enlargement of the gland will begin. The set of symptoms typical of the enlargement of the gland is called Prostatism, and they stem from the bladder's inability to become completely empty. A frequent need to urinate, difficulty in emptying the bladder, urinary tract inflammation, and pain while urinating and sitting- these are the symptoms that accompany the enlargement of the prostate. Regular taking of Prosta Guard will reduce and prevent the enlargement of the gland and will relieve the symptoms of Prostatism. The fruit of this plant contains fatty acids which prevent the enlargement of the gland and reduce symptoms quickly. Works synergistically with Pygeum extract. Relieves inflammation symptoms, maintains proper functioning of the gland and reduces risk for and symptoms of benign enlargement. Contains powerful antioxidants with anti-inflammatory and anti-carcinogenic effects. 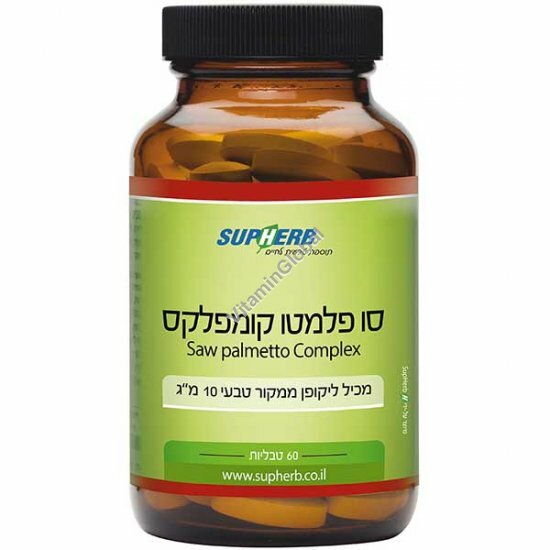 A powerful diuretic; prevents blockage of urinary tract and is recommended for treating a benign growth of the prostate. A powerful antioxidant which gives the tomato its red color. Treats and prevents prostate cancer. The prostate contains a high Zinc concentration, more than any other organ in the body. Taking Zinc will reduce and prevent the enlargement of the prostate gland. A powerful antioxidant mineral, with hindering effects on the development of prostate cancer. A vitamin with anti-carcinogenic hormonal activity, prevents and hinders the development of prostate cancer. Directions: One tablet a day, with the meal. Available in packages of 60 tablets.